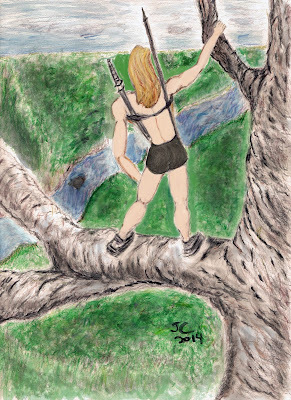 The following is an excerpt from the novel "Caitlin Star and the The Rise of the Barbarians", Caitlin Star book 3 by James J. Caterino. The room was dark and scary. An antique television console sat on the floor, the screen flashing as it hummed to life. A blinding, fuzzy, static roared across the monitor, growing brighter until a loud series of beeps screamed out from the tiny television speakers. “This is a message from the Emergency Broadcast System. Please pay attention. This may the last broadcast possible,” the authoritative voice-over said. The static on the screen morphed into a studio setting. It was a news broadcast and everyone on the set looked panicked—shuffling papers, rushing about, and running for the exits. The people looked distraught—in a state of grief. Many of them could be seen crying and hugging each other in the background. A stressed out man in a disheveled suit with several days’ worth of beard stubble growth moved toward the camera. He sat down at the anchor desk and read from his notes as he spoke. The newscaster stopped reading and put his head in his hands to compose himself. Then he looked back up into the camera. “The A.P. report ends right there…” the newscaster paused again, shook his head in despair, and then looked back into the camera. “We can only assume that they have lost their satellite—just as we shall too when the EMP bursts and the viruses they unleash finish off the last of whatever is left up their functioning. We may in fact be the last remaining broadcast anywhere. The final vestige of a crumbling infrastructure to a civilization—a civilization that had been sowing the seeds of its destruction for an awful long time. The newscaster stopped again and looked off in the distance as if he were still struggling to fully grasp all that had happened in such a short period of time. The newscaster gave an empty stare into the camera. The screen turned to static. Caitlin pulled the focus of her vision backward and could see the screen was part of an old-fashioned floor console television set. The kind they had not made in many decades. She looked around and could not believe it. This was the home she grew up in, and right there on the couch next to her were her foster parents, Joe and Rada. Caitlin cried. She had missed them so much. But they looked sad. The broadcast had upset them. Through the tears, a horrible panic came to Caitlin. The panic and sadness became so intense. Caitlin felt it smothering her—choking the life out of her. She began to hyperventilate until could not breathe. All around her the room warped and morphed into a buzzing static of white noise. Loud, smothering, choking, blinding static—louder and louder and louder. None of this could be true. Joe and Rada were taken from her before the wars—before the Moral Authority. And this room—that old TV—it was the cottage at Yellowstone the way it was when she was a child. Did she go back? Was she in her bed about to wake up with Rada waiting for her with breakfast? Running away to Pittsburgh, Gunner, the training, the civil war, Zahn and the apocalypse—was it all an epic dream? Maybe if she woke herself up she could make sense of her nightmares—these endless horrors of heartbreak and of battles and wars and fights to the death. Then it began to hit her. What was real—and what was the dream. She ached for Rada and Joe, the only parents she ever knew. She wanted to see Sheeba, the loving and loyal wolf she raised from a pup. If only she could find a way to stay here—in this world—in the past before it all went so wrong. Maybe if she jumped into the static and kept moving. Caitlin felt herself falling and falling until—smack. She opened her eyes and found herself lying on a cold rocky floor inside a dark cave—inside her real home—in the present. 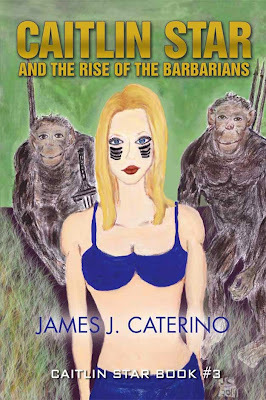 Read on and experience the dramatic action and unforgettable characters of "Caitlin Star and the Rise of the Barbarians"!